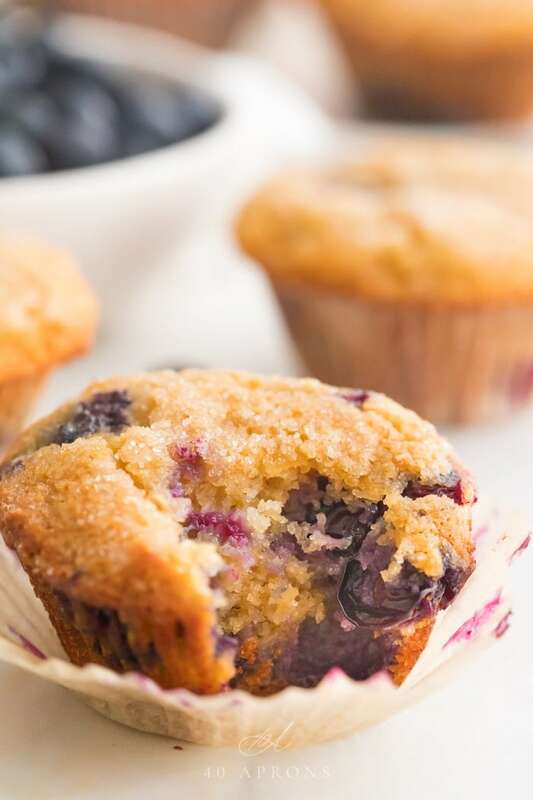 These paleo blueberry muffins are out of this world! They’re perfectly sweet and tender, and you’d never think they were gluten and grain free. Made with honey, they’re spiked with just the right amount of lemon zest to give them that bakery taste. Refined sugar free, too, so no guilt here! Freddie Mercury told me so. But really? It took me six rounds to get these muffins just right. And, if you read my blog or follow me on Instagram with any sort of regularity, you’ll know that I’m a bit of a perfectionist. So that means six rounds. In three days. But now? Lucky dishwasher/husband! They’re perfect. I didn’t want to settle for anything less than that and, by golly, you don’t have to, either. Soft and tender but still firm. Not overly moist, not too soft. Sweetened with honey and spiked with lemon zest. Bakery-style with nice domed tops and a crunchy crust of cane sugar. Really easy to make! You can make them in about 30 minutes, then they’ll cool for a few minutes after that. Grain-free, gluten-free, dairy-free, and refined-sugar-free, if you skip the cane sugar topping. Light and golden in color and in taste, thanks to the honey. To use frozen blueberries, first rinse the blueberries in running, cold water until the water running off turns from a dark blue or purple color to a lighter blue or red color. Then dry the blueberries very, very well. Fold into the batter very gently. Use parchment paper muffin liners for the easiest peeling ever. Or try a silicone muffin tin to pop out the muffins easily. Fill the muffin tin almost to the very top. Use a 2-oz. disher to do this super quickly and easily. Sprinkle the tops of the muffins with a very generous helping of cane sugar for a gorgeous, crackly topping. You want the tops totally and heavily coated for best results. You can skip this part and opt for a crumb coating, if desired. Try this recipe’s crumb top. In a large bowl, whisk together all dry ingredients. In a medium bowl, whisk together all wet ingredients until smooth. Fold wet ingredients into dry and stir until smooth. 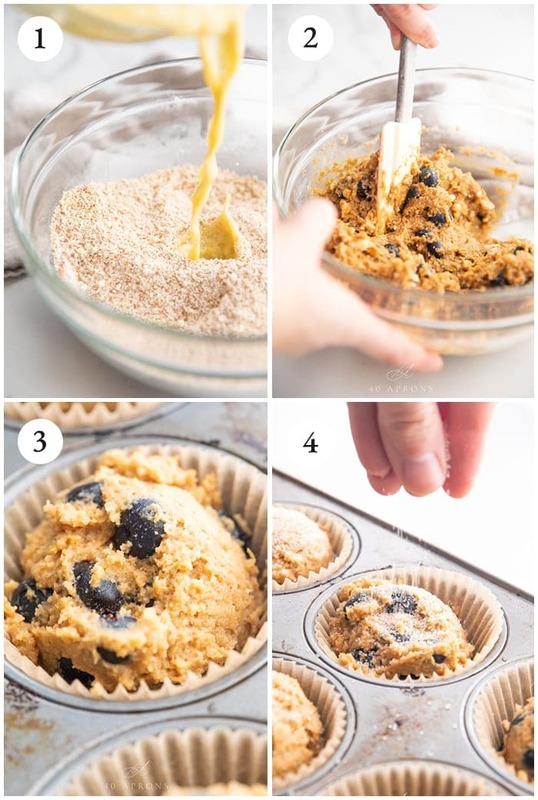 Fold in blueberries and mix until combined. 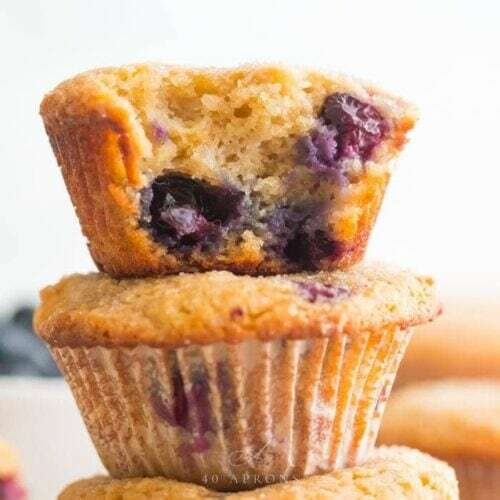 Portion batter into paper-lined muffin tins, to the top. Bake at 325º F for 25 minutes, or until a toothpick inserted into the center comes out clean. Remove from oven, let cool 10 minutes in muffin tin, then remove all muffins from tin. Let cool fully on a wire rack. They’re best kept in an airtight container, but the tops will become a bit moister, rather than crackly from the cane sugar crust. However, they will stay good up to 5-6 days in an airtight container kept at room temperature. They should freeze well, too. This recipe for an egg-free variation. Can I skip the lemon zest? You can! However, it doesn’t make them too “lemony,” just perfectly complemented, fresh, and springy! Can I reduce the amount of honey? You can, most likely. I would not reduce it below 3/4 cup without altering the rest of the recipe in some way, likely just reducing the amount of coconut flour and tapioca starch by 1 tablespoon each. I have not tested the recipe with these modifications (Since they’re essentially limitless! ), but that should work! Can I replace the honey with [granulated sweetener]? No! I tested five batches of paleo blueberry muffins with granulated sweetener, and I didn’t get the perfect muffin until I used honey. More importantly, this recipe and the flours used are developed specifically to support a liquid sweetener. It’s possible that using maple sugar or erythritol may work, but I can’t guarantee anything. 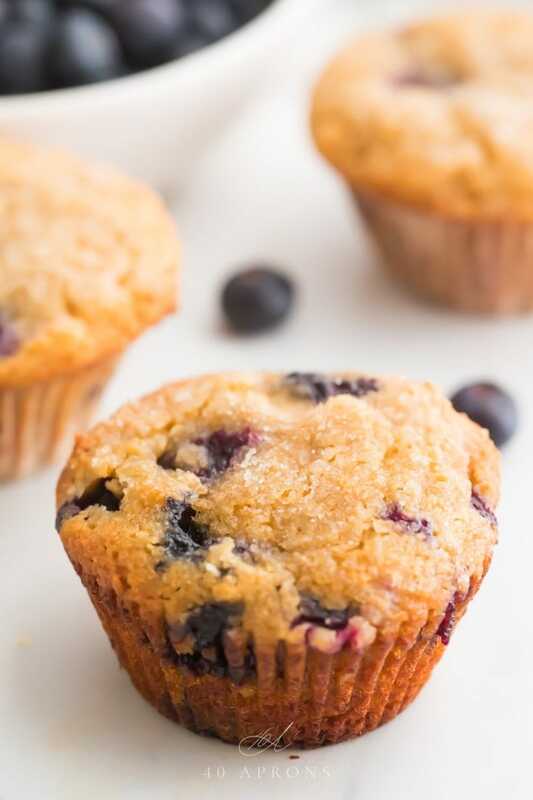 Light and fluffy blueberry muffins that are out of this world... and just happen to be paleo. Made with honey and lemon zest, they're bakery quality with a nice dome and lovely texture. 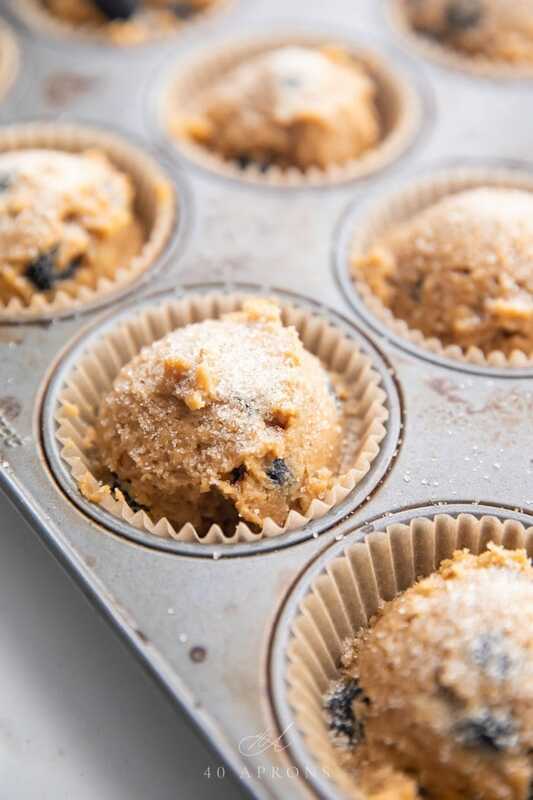 Preheat oven to 325º F and line a muffin tin with paper or parchment liners. In a large bowl, whisk together all dry ingredients. In a medium bowl, whisk together all wet ingredients, except blueberries, until well combined. Fold wet ingredients into dry and stir until well combined. Fold in blueberries gently. Portion the batter into prepared muffin tin, filling almost to the top of the liners. Sprinkle with a generous amount of cane sugar for a topping then bake 25 minutes or until a toothpick inserted into the center comes out clean. Let cool 10 minutes in muffin tin then remove and let fully cool on a wire rack. Rinse the blueberries in cold water until the water turns from blue to a very light red or blue. After rinsing, dry the blueberries very well with paper towels. Fold the blueberries into the batter quickly and gently; don't overmix. 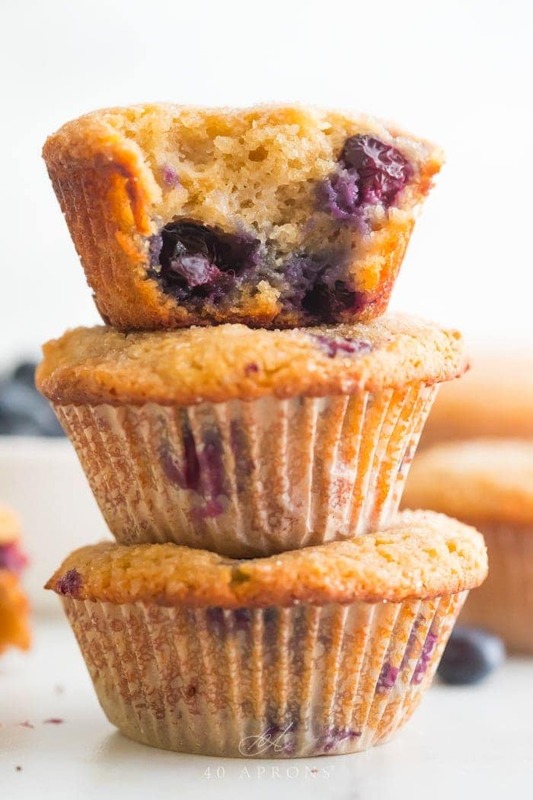 These paleo blueberry muffins are best within a couple days of baking. Keep in an airtight container for best results, though they will become softer and moister after a couple days, due to the environment in the container. These should freeze well. You're absolutely free to skip the sprinkle of cane sugar, or you can try maple syrup. Consider a paleo crumb top, like this recipe. I like parchment liners as they are totally foolproof and will not stick to any muffins! This recipe has not been tested with any other flour combination or sweetener. If you choose to use a powdered sweetener, like coconut sugar or erythritol, you might want to increase the milk just a bit. However, I cannot guarantee the results of any modifications to this recipe. To test for doneness, insert a toothpick into the center of a muffin. The toothpick should come out clean. After about 20 minutes of baking, test every 5 minutes. Definitely do use the advised liners. I tried skipping that step and even with meticulous greasing I ended up digging out my muffins. Still very delicious, but also very ugly and had to eat them with a fork. I was almost out of honey so I used 1/2 cup and then added a dash of coconut sugar. Used coconut sugar on the top as well. Loved these! !